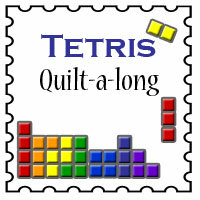 You'll often see talk about "using one's stash" or "stashbusting" on quilt blogs. I'll admit, I have a fabric problem (which, when I think about it, is MUCH BETTER than most "problems" I could have!). No worries, I'm not going into debt over my fabric habit. But it does make me think "How can I bust out my stash to start new projects?" I had a good opportunity to bust a move on my stash when I learned about a fundraiser my sweetie was organizing for her nonprofit group. They were putting together an art show during a local city's "art night out" and I thought, I could make some baby quilts. This last week I managed to get four of these sandwiched and quilted! These were all fabrics that came from my stash, mostly swapped charms (the black/white/red quilt) and from Connecting Thread charm packs I received for the holidays last year. I have a "bold" sampler strip set (two actually) that I'll pull parts from to make the sashing as best as I can and use stash for the rest. What a great stash buster AND for a great cause! The pattern is from Oh, Fransson! and goes together quickly. They look pretty sharp on my friend M's clothes line! A bit wrinkled but I think they will be okay. I'm really happy with how this pattern turns out - quilt and easy and it looks great! - and I'm excited to see if we can get them all sold! Pets on Quilts Show - My Kiddos! SewCalGal is doing a Pets on Quilts Show and I decided to play along by doing a post. Cool, eh? 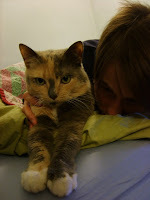 I have two cats, Mimi and Cory, and many, many cat friends. And, like many cats, they like to help. 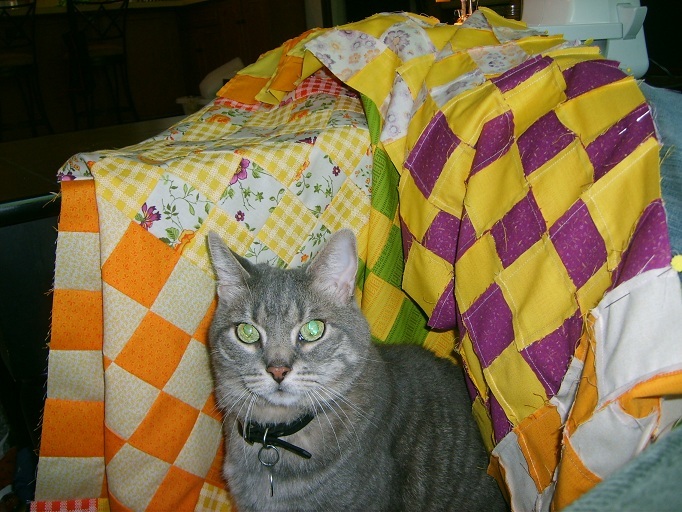 Mimi is a quilt cat. She loves everything about quilts, especially claiming them as hers! She likes to "help" around the sewing table by trying to eat thread and fabric that is on the floor. I've become very good at tidying up to keep her safe! My other girl, Cory, enjoys the sleeping and destroying part of quilting. 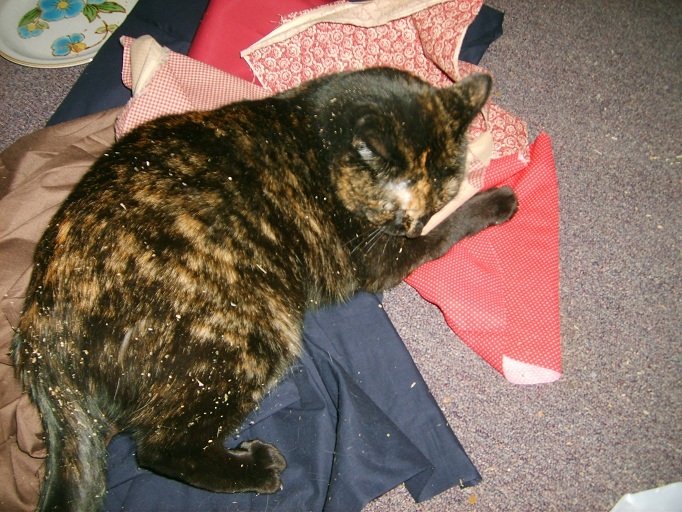 Here she is in a big pile of fabric, high as a kite on catnip. Good thing that pile was in the "to be washed" pile - she had fun tossing it around. This is Mr. Munchchichi. He decided to burrow a nest into this top that I was piecing together. He looks quite satisfied with himself. He also enjoys a good nap on my quilts and cuddling with my sewing box. He is the child of M, my buddy. This is Siobhan, another kitty friend and child of my buddy S. She was helping me model these swap blocks. I guess I don't have a lot of pictures of my cat friends and quilts but the ones I do have a very cute. I will continue to look for the one of my sister's cat Baby who "helped" me "arrange" some blocks once. It is very cute! Hopefully I can find it somewhere. Yup, that's the lemonade quilt. It's bright! I stopped at 4x4 blocks because I was stash busting and using up some roll leftovers. I thought, this is a small quilt, but it will be a good quilt when it is finished. I wanted to go bigger but didn't want to introduce different fabric lines into it. Something about these prints made me want to showcase them. ETA: As a side note, a strip is a little too short for these blocks but I found that a strip and a charm and a little elbow grease get the job done (you need a strip and a charm of 2 different fabrics for 1 block). Now the problem is, do I make this quilt bigger? Wait, not a problem. Yes, I will make it bigger. Some thoughts I have. Not sure which to do... help me out! 1) Pull the blocks apart and make more using all sorts of colors from this line (would include adding more green and some purples, reds, and the like to this quilt). 2) Leave alone but make more blocks with the fabrics used in it already to make it a bit bigger. 3) Leave alone and use different colored blocks around the edges. What do you think? 4x4 quilts are nice but I like 5x5 and 5x6 best for what I use them for - sleeping! happy quilting star quilt along - yippie! I've got all my fabric ready for next week, when the sewing part of Happy Quilting Start quilt along starts! I love traditional blocks. I mean, I LOVE THEM. Churn Dash? CHECK. Ohio Star? CHECK. This quilt along is right up my ally AND it gave me a great excuse to pick up some sweet fabric. I had my eye on the Retro Active line from Stonehill Collection and thought, you know, this is it. I matched it with some Konas (sage, flesh, and a purple I'm not sure about!). I love that big flower print - swoon! I plan to match a peach with a purple for the blocks and to use Kona bone (I think that is what it is... good enough, right? Kona something or other!) for the background. The plan right now is to do a 20 block quilt with boarders. It is the perfect size for little old me! 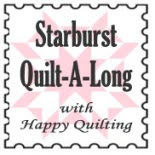 Happy Quilting is hosting a giveaway for $50 for the Fat Quarter Shop! The fun part is is that you get an entry for saying what you would buy. Right after posting, I got a instant message from a friend saying they are having their first baby early next year! Now I want to change what I would spend it on - I would have them pick out a layer cake or roll that I could make them a baby quilt with! (This also makes me officially the only one from my high school group to be unmarried and child free. LOL!). I made this when I was in elementary school. Early elementary, like 2nd grade. My grandma sewed (not quilts though) and we would always play in her stash, making doll clothes. 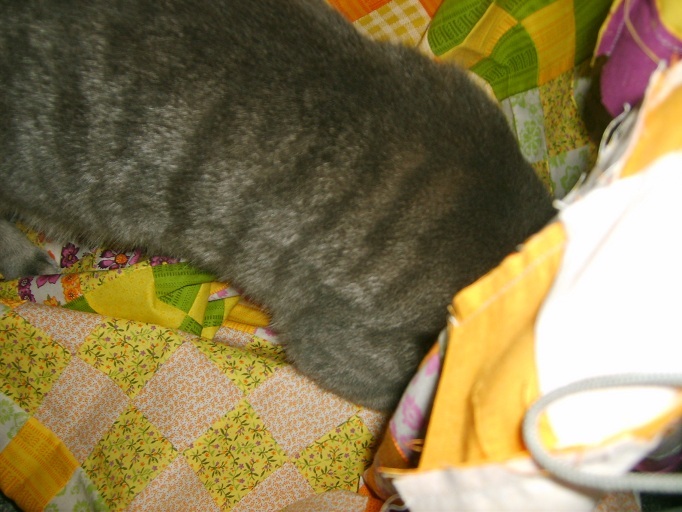 I'm not totally sure how I got into quilting. I remember checking TONS of craft books out from the library and I'm sure this is where the bug came from. I made this all by hand - cut the squares out, big loopy stitches. A couple years later, once I learned to use a machine, I redid the seams so it wasn't so "falling apart" looking. This quilt is made with all kinds of different fabrics - cottons, some lightweight denim, stretchy green terry cloth... it's pretty awesome! You can even see a couple of the hearts I appliqued on there. I think it is kind of cool, seeing that I was a little kid trying something out. I'm surprised I still have it. I made a sampler top in 5th grade which went missing a long time ago. I wish I still had it. There is part of me that wants to pick up fabrics like the ones in this one and make a second one that is "done right" or even pull this one apart and put it together better. But I like how wonky it is. I like how the points don't match and the fabrics are "all wrong." It is a sweet reminder of where I've been and how far I've come in my sewing. It's pretty awesome! I picked up some yummy new fabric for a new quilt project recently. 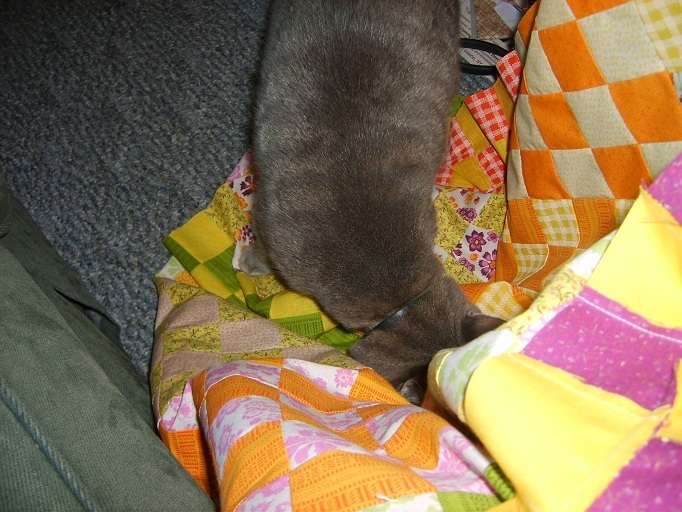 The plan is to make the Batch of Brownies quilt in The Practical Guide to Patchwork. I've started buying more of the "premium" quilt fabrics at Joanns and I've been very fond of the Stonehill line. They always have cute stuff going on! All of these except the small dots on yellow/green are from the Fiesta line. I actually found another print from the line the other day (a large flower print) that I want to pick up this weekend. I can't wait to get cutting into this stack. It is delicious.